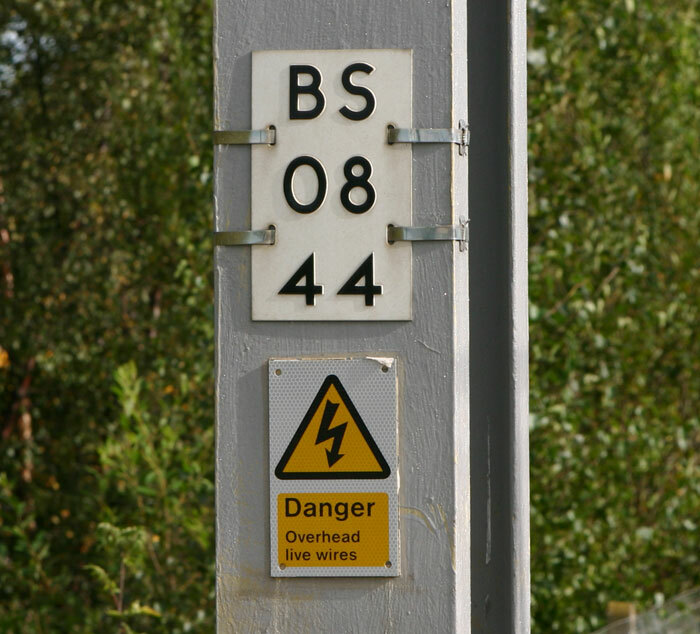 This is a list of codes associated with British railway overhead electrification installations. The photograph below shows a prefix code "in action". The "08" shows that the mast is in the 8th mile from the datum, and the "44" that the mast is the 44th within that mile. Some routes, such as the East Coast Main Line, use metric measurements, but the mast numbering principle is the same. For the meaning of other electrification-related signs, this "Railway Signs" page should answer all your questions. One sign not on that page is yellow with black letters "D E P" arranged vertically. This defines a designated earthing point, and an image can be found on another "Railway Signs" page. In general, main line schemes up to around 1972 are measured in miles and those after in km (metric measures came in for the northern electrification of the WCML). The WCML (prefix G) switches from miles to km at Weaver Junction so there is a big gap in the numbers there. Also note that the datum points for the masts are not necessarily the same as for milepost milages. For example, on the Manchester Airport line (prefix MIA) the mileage number starts from Heald Green North Junction, but the milepost count runs from Manchester Airport station. In many cases, the letters refer to the ends of the line of route, the first letter often referring to the datum. Thus DW would be "Dudley to Winchnor", though there are two separate sections electrified. Other letters refer to older conventions of giving each route a letter, and branches off that route a second (and in some cases, third) letter. The Great Western main line scheme introduced a new labelling system, which has since spread to some other lines. Prefixes are generally the appropriate Engineers' Line Reference, with the numbering in two rows defining the distance from the datum in km; the first row giving the whole kilometre and the second the decimal part (to three decimal places, i.e. to the nearest metre). Stephen Murray has kindly produced this sketch (updated to 1 June 2018) showing the national network codes used and codes allocated but not used (opens in a separate tab). This site allows users to download a free guide describing overhead electrification and what all the components do.